The term "art deco" is often used when describing watches and it's misapplied about as often as the other regularly occurring term used to describe watches... "rare". Rare is probably a matter of opinion but art deco actually has a definition. Art deco was a decorative style that was very popular in the 1920's and '30s. It often used bold geometric shapes and patterns of shapes along with sharp colors. 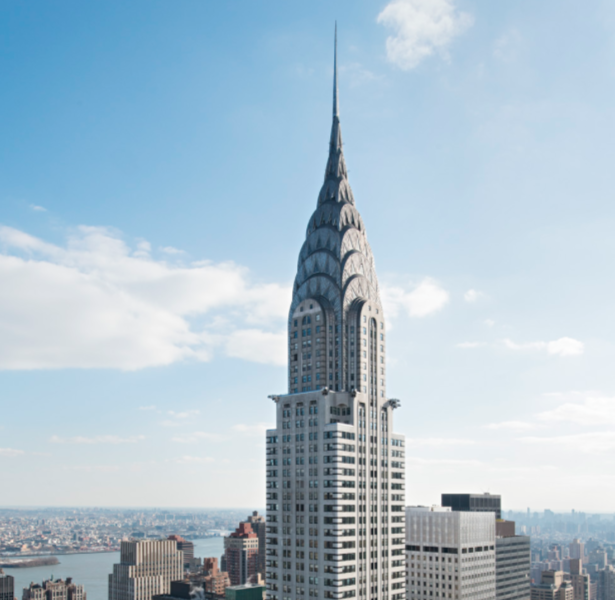 I often think of the Chrysler Building in New York City when I think of art deco style. Although the Empire State Building is a great example too. Advertising posters from the period are usually nice examples of the art deco style. Hamilton had a number of art deco-inspired watches. 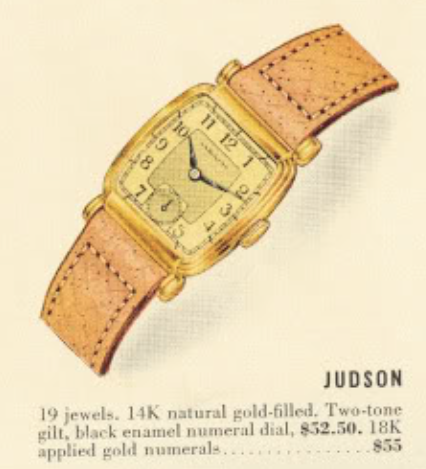 One of the last ones was the 1940 Judson. It was only produced for a single year and in my opinion was the last truly art deco model. Of course, the 1950's had some pretty wildly shaped models too - but that's a totally different style. The Judson came in a 14K yellow gold filled case. Two dial patterns where available, a two tone with black enamel numeral dial as shown in the catalog and an AGN dial with solid 18K gold numerals. In 1940 Hamilton introduced the 19 jewel 982M movement for solid gold models. The 14K gold filled models received the 19 jewel 982 movement used previously with solid gold models. The 10K gold filled models received the 17 jewel 980 movement. So, you should see a 982 under the hood in the Judson. The Judson is not a rare watch but it is very hard to find one that is in great shape because the case design has large rounded lugs that are prone to wear through. I recently received a pair of Judsons that were in need of some TLC. As they say, when it rains, it poors and getting two Judsons at the same time was a bit of treat. The first one has a refinished gilt dial. The case shows considerable wear and the lugs are splayed outward a little. However it should clean up nicely I think. The expansion bracelet will have to go though. The other is the AGN version. This one has a much nicer case. It too has a refinished dial. The first up for a trip to the spa is the gilt version. As you can see, the tops of a couple of the lugs are worn almost smooth. The back has some wear through too but it's not horrible. Notice the back of the lugs, the lip to pry the case back off and the wear spot by the crown. All very typical spots for wear. I like how the stepped design of the case carries over to the back of the watch though. The glass crystal is beat up and will need to be replaced. The dial looks okay but it's not correct. I would call it "close but no cigar". First, the Hamilton font is incorrect but mainly the numerals are the incorrect style too. Here's what it ought to look like. Check out the style of the numerals. Remember, art deco things tend to be bold and these numerals are much more complex than the simple numbers on the refinished dial. The 982 movement is correct for the watch and other than being very dirty, it's in good shape. Want additional proof that the dial is refinished? Check out the numbers scratched into the back. Case closed. Here's an odd occurrence. The mainspring barrel is split. That can cause the barrel to drag and the watch to loose energy. A parts donor will correct that situation. The blued mainspring inside the barrel is set and needs to be replaced as well. With a new mainspring the watch should run 40 hours or so on a full wind. I prefer to use Hamilton white alloy mainsprings whenever I can find them. I'll prep a new glass crystal while everything is in the cleaner. Shaping glass with 600 grit sandpaper is very doable but it can take 30 minutes or so to get it just right. Everything is cleaned and dried. Now it's time for some reassembly with fresh lubricants. The watch movement appears to be purring like a kitten. It's off to the timer to see how well it's really running. Not bad at all... just a minor tweak to the regulator will speed it up slightly but this watch is doing just fine after being originally manufactured 75 years ago. The AGN version has a sharper case. If the gilt dial was better, I would be tempted to put that movement in this case. I think the gilt version of the Judson is much more interesting than the AGN version, even though the AGN version was more expensive originally. Notice how much nicer this case back is than the other one. This movement is running pretty well already but I can tell from the haze on the parts that it's been a while since it was last cleaned. As suspected, it's also a refinished dial and also not quite correct. 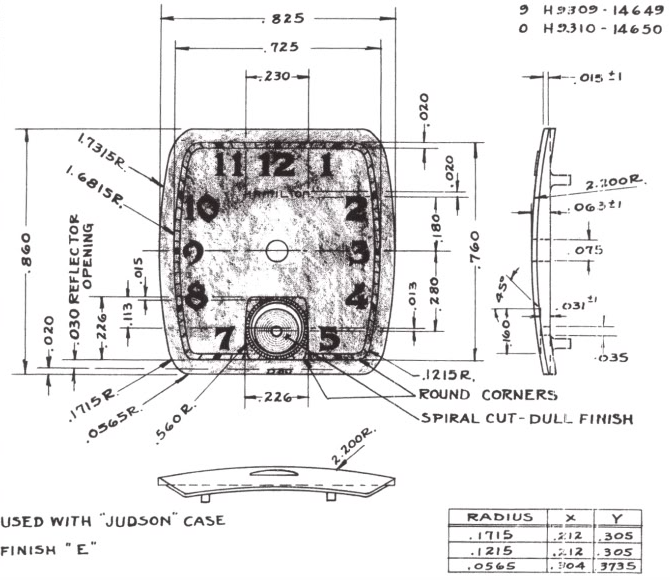 Notice the shape of the seconds register on the pattern below and compare it to the refinished dial. Again, close but no cigar. Like the other Judson, this crystal is scratched. However, this one is plastic and I can probably buff these scratches out so that it's defect-free again. This mainspring barrel already has a white alloy mainspring. I'll remove it and clean it like any other part. Turns out this white alloy mainspring is set too. That's a little surprising. I bet it's not the correct mainspring. It also coils upward as well as out. That's a sign it was put in by hand (without a tool) and can rob the watch of energy because the spring pushes against the inside of the barrel. Here's what a new mainspring looks like when it's not installed. It actually coils the opposite direction like a decorative S.
This 982 is back to running nicely as well. It's off to the timer now too. Well, it's beat rate and amplitude is very nice but the beat error of 4.1ms is a bit high. It was much lower before I started working on it so I'll see if a trip through the demagnetizer will do the trick. Ah - much better. I like to leave watches running a little fast as they tend to settle down eventually. That's two in the bag. 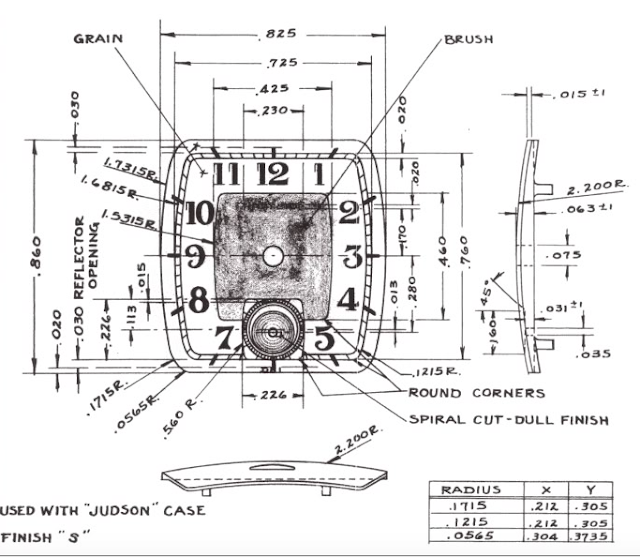 This Judson case is so nice, it's deserving to have a better looking dial inside. Deciding whether or not to refinish a dial is sometimes a tough decision... an okay looking original dial is often preferable to a nice looking refinish. However, it's a lot easier to decide when the dial is already an incorrect refinish. After all, why not have a nice and correct refinished dial over a so-so incorrect dial? So now it's really just a matter of deciding which dial to get redone. I know which dial I would get redone... which one would you choose? Maybe getting the AGN dial redone makes the most sense particularly since the case is in better shape. BUT, I love the look of the gilt dial. I'm not sure about the numerals. They are somewhat Art Deco, but maybe more 50s modern? Even with the different numbers, I like this dial better. Could be the two-tone treatment, which I think adds to its Art Deco bonafides. All in all, the Judson, regardless of the dial, is a good looking watch. I think the gilt dial is the better choice too - and then I'd re-case it in the better case. The black numerals on the dial pattern look a lot like the original AGN numbers used when they were referred to "raised gold numerals". Redoing the AGN dial wouldn't be a bad decision either though.